Amsoil is about no compromises. You want your oil clean down to the desirable 2 micron number. We have the best oil filter for this bypass oil filtration. We provide the complete solution; the filters, the Bypass oil Filter kits and all the plumbing and fittings, installation guides and pictures of actual installations. Please call we will get you set up call/txt 860 436 7034. The diesel tab on the left has links to specific diesel engines. There are some .jpgs of actual installs lower on the diesel pages. There are actual installation .pdf files organized by Amsoil bypass filter type (BMK) here. For the best price please go here. PRODUCT DESCRIPTION : The picture above shows the AmsOil bypass oil filter kit BMK21( left ), AmsOil bypass filter kit BMK23 (center), and the AmsOil bypass filter kit BMK22 (right). Here are definitions ( jargon) for bypass filter kits. The Bypass Filter(EABP 90, EaBP100, EaBP110, EaBP120 ).You choose the size by your sump capacity. If you want 2 micron clean oil this is the best filter. The undisputed industry leader. The letters EA mean each ( one ). The letters BP mean bypass filter, this refers to the actual spin on filter. The numbers after BP refer to the size 120 is the tallest 90 is the shortest. These you select by how much room you have in the mounting area of your vehicle. All the BP filters have the same width and thread. Larger means less oil changes cleans to a 2 microns Sizes and capacities of the Bypass Oil Filter are lower on this page.Here is the table showing their size and capacity. BP Fittings. These parts are generic plumbing parts required to move attach hoses and help route the oil hoses around the engine compartment. Oil Analysis:Engine oil analysis is used to let you know what is going on inside your engine. It gives you a list of all the metals and byproducts in your oil. This lets you actually see how well your filters are working and what kind of shape your oil is in. Engine oil analysis helps increase your comfort level also. Using oil analysis with the Amsoil bypass oil filter and and an oil with a high base number ( HDD 5w30, AME 15w40, ACD 10w30 sae30 ) you can all but eliminat oil drains. We have testimonials showing diesels in perfect shape after 400,000 mi without an oil change, just filter changes. Please contact us for a copy of the study call/txt 860 436 7034 santana. Soot Removal: AMSOIL has designed the bypass filter kit around a new high-efficiency bypass filter element that is also a soot removal device. 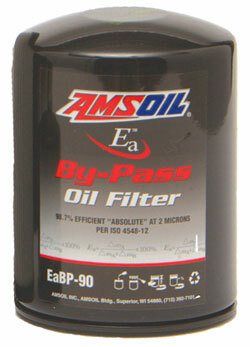 AMSOIL Ea ByPass Filter element uses a synthetic/cellulose sandwiched media. The inner layer of the element is composed of a highly efficient cellulose media covered with a full synthetic media outer layer. According to ISO 23556 testing, these bypass filter element removes 39 percent of soot contaminants less than one micron. Soot removal efficiency increases approximately 10 to 14 percent when the EaBP bypass Filter element is used in conjunction with a standard Eao or Donaldson Endurance oil filter. Save money: You save money because will reduce wear and reduce oil changes, You increase wear protection so your rig lasts longer, you use less fuel. Since your maintenace is done you can focus on your business so you not only save money that can make money. Amsoil low cost bypass filter will reduce wear and reduce oil changes When used in conjunction with AMSOIL motor oil and an EaO or Donaldson Endurance filter, EaBP Bypass oil Filter should be changed less, basically every other full flow filter change up to 60,000 miles. When used with other brands of motor oil or full flow filters, the EaBP filter should be changed every other full flow filter change. AMSOIL recommends using oil analysis when extending oil drain intervals EaBP filter: The Ea By-Pass Oil Filter (EaBP) provides the best possible filtration protection against wear and oil degradation. Working in conjunction with the engineâ€™s full-flow oil filter, the AMSOIL Ea By-Pass Filter operates by filtering oil on a â€œpartial-flowâ€ basis. It draws approximately 10 percent of the oil pumpâ€™s capacity at any one time and traps the extremely small, wear-causing contaminants that full-flow filters canâ€™t remove. The AMSOIL Ea Bypass Filter typically filters all the oil in the system several times an hour, so the engine continuously receives analytically clean oil. This is how the Bypass Oil filter kit reduces wear. Single Spin on element EaBP 90 Diam. = 4.3 in. Single Spin on element EaBP100 Diam. = 4.3 in. With Mnt. = 10 in. 1.5 qt. EaBP110 Diam. = 4.3 in. Marine (Dodge w/Cummins 2004 and later) EaBP90, 100 and 110 BP44, 45, 67 and 89 Add-on by-pass filter kit. Includes mount, hose and fittings. Order filter separately. EaO10, 34, 42, 96, 15* or 26* BK21, 22 and 43 Relocate full-flow with by-pass filter. Includes mount, hose and fittings. Order filters separately. Dodge with Cummins engines EaBP100 and EaO26 BK21, 22 and 23 Relocate full-flow with Cummins engines bypass for 5.9 and 6.7 liter . Includes mount, filters, hose and fittings. Ford with International engines EaBP100 and EaO26 BK21, 22 and 23 International engine Powerstroke Relocate full-flow with by-pass for 6.9, 7.3 and 7.5 liter . Includes mount, filters, hose and fittings. GMC with Isuzu engines EaBP100 and EaO26 BK21, 22 and 23 Duramax Isuzu diesel engine.Relocate full-flow with by-pass for 6.6 liter Includes mount, filters, hose and fittings.